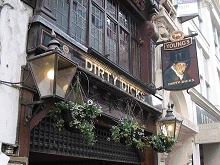 Evening private London pub tour including lights of historic sights of London. Departure time at clients request from their London hotel. Package includes the vehicle and the qualified driver-guide. Evening London is a romantic city in complete contrast with vibrant London by day. Leisurely admiring the illuminated streets comfortably seated and noting thus the contrasting choice of nightlife in different areas of London. An excellent place for supper while visiting pubs full of history in unusual London locations and the best way to relax tired feet. You will see examples of oldest pubs, historical pubs and pubs famous because in the past they were frequested by well known people. Riverside Pubs are also very popular and pubs well known because of past events stretching back to the times of Henry VIII. Your tour guide choose theme pubs and clients decide choice. For example, a short walk following the footsteps of 'Jack The Ripper' down the narrow, gloomy alleyways immortalised in many films. 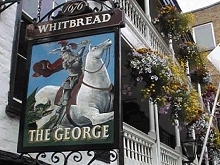 Pubs are very typical English institutions, visited by many people and enjoying a renaissance thanks to their unique atmosphere and ancient architecture. Pub food is very reasonably priced and there is time for tasting a typical English beer and/or a 'fish and chips' light supper served in traditional style (food and drinks not included). At the end of the tour, before returning to your hotel, we include a stop in Soho at approximately 22.30 for those of you who wish to leave us there, wish to explore the London night life a little longer and make your its own way back to the hotel. Flexible departure time. Price on request on receiving number of people and dates required. Departure from hotel of clients. Package includes car, professional driver-guide, parking, local taxes and hotel pick up.